Temperatures have dropped way down to the single digits routinely every night and sometimes below zero so it is time to head south for the rest of winter. 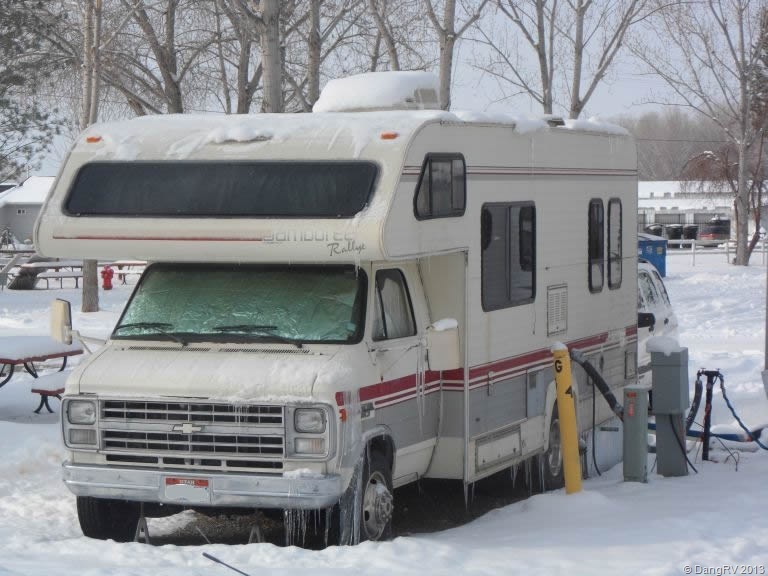 6 inches of snow is on the ground and icicles are dangling off all the rigs as you can see in the picture of the motorhome behind me. Everything has frozen on the new rig except for the inside plumbing which is certainly an improvement over the previous trailer. They also did a good job with placement of the water tank on the new 5th wheel. Rather than being under the bed with no heat like the last one, it is in an outside compartment near the furnace so the water is warm enough not to sting the hands with cold. To get ready to leave is taking a lot of work and time with everything else frozen. The black water tank and one of the gray water tanks froze along with the sewer hose and the gate valve to the other gray water tank. The new awning over the slide out was full of an ice pond on it. The truck was full of snow and one door iced up. Fun, fun, fun. Before you all start commenting on ways to avoid some of these issues, yes I know them. There were circumstances beyond my control which prevented much of them and keep in mind I just got this rig and am still working on improving it. Some things like tank heating pads only make sense in cost if I planned on snow camping more which I do not. A skirt would have helped tremendously but again I just got this rig and don’t have one yet. The $1500 cost will have to be budgeted for. One thing I have learned this week is to keep some wood handy for my wood stove. Running out of propane early in the morning is no fun. Yes, my 5th has a wood stove installed in it as a backup heat and cooking source. My best friend the last couple of days has been hot water. I was able to use pots of hot water (not boiling) thrown on the slide out awning to get the ice pond to break up so I could gently get it off in chunks with my truck’s snow brush. I used some heat underneath the tanks which helped the gray water tanks but the biggest helper to unfreeze the black water tank was pouring boiling water down the toilet and some RV antifreeze I finally found onboard. Once the tank was emptied, I added the rest of the antifreeze to it. I also used hot water to soften the sewer hoses and melt enough of the ice inside them to get them flowing again. I just poured it over them. Running hot water through them helped with most of the rest of the ice and allowed me to disconnect them to pull them inside. My bath tub is now full of hoses LOL. I’m keeping them warm in there and letting what ice is left in them melt until I get where I’m going. Almost ready to fly. A little more packing up needs to be done. A few improvement projects have been put on hold until I get somewhere warm. Looking forward to seeing my friends and family who are already down there.